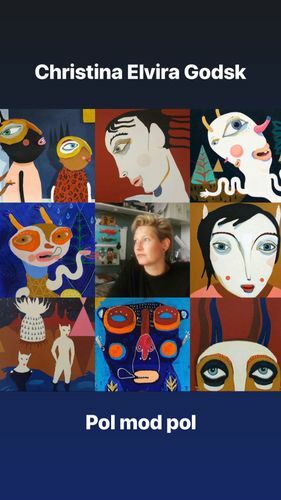 My name is Christina Elvira Godsk I'm a Danish artist, living a little outside Copenhagen. In my artistic work, I am often absorbed by existential themes in the emotional life of modern people. Duality and division, is a recurring focal point in my work. My proverb is illustrative, figurative and naive, where a distant or dreamy expression often goes back in my pictures. I am drawn by colors, patterns and the ability to unite it naive and humorous with the vulnerable and ambiguous.